Happy Fathers Day! What? Is it not the Fathers Day today? In Spain, it is! Today is Saint Joseph’s Day, and in Spain the holiday is also celebrated as a Father’s Day. To remind, Saint Joseph (San José) was a spouse of the Virgin Mary, and the step-father of Jesus Christ. The holiday has been celebrated since the 15th century, and, as it traditionally falls during Lent, it was traditionally observed as a day of abstinence. As a result, traditional meals on St. Joseph day were made up of meatless dishes. As St Joseph’s day traditions vary from region to region, one could certainly expect the holiday to be somewhat more festive than a modest meal, after all this is the Spanish culture we are talking about, right? This is especially true if we look at Valencia, the region in the South of Spain. To commemorate St Joseph, Valencians hold traditional celebration called the Falles, or Las Fallas. 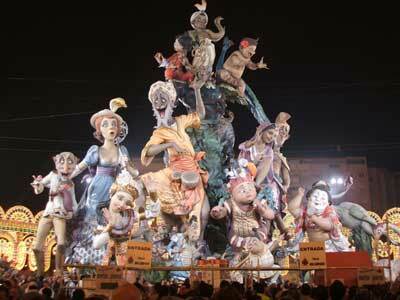 The term Falles refers to both the celebration and the monuments created during the celebration. Traditionally, each neighborhood of the city has an organized group of people, the Casal faller, that holds fundraising activities all year round to raise money to produce a construction known as a falla. 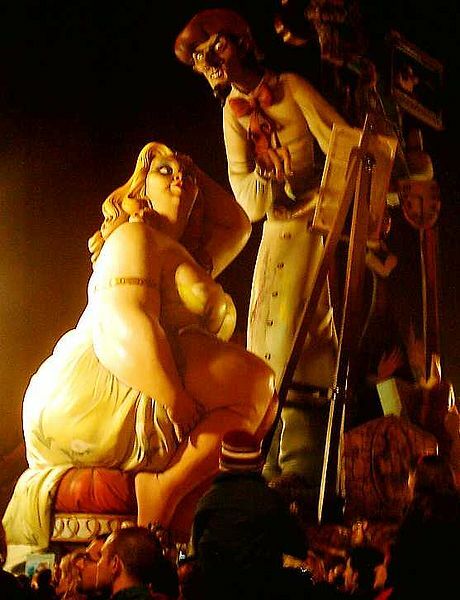 The fallas are usually big statues of various comic characters and satirical stories. Falles is a festival that lasts for 5 days and culminates on St Joseph’s Day, and every day and night of the Falles is a glorious party, with processions and comedic performances, in the streets, people celebrating at restaurants and terraces outside, enjoying non-stop vivid fireworks every night. Foreigners are often surprised to see everyone from small children to elderly gentlemen throwing fireworks and noisemakers in the streets (and how littered the streets become). La Cremà (the Burning), the climax of the Falles, takes place around midnight on March 19, these falles are burnt as huge bonfires. This is why the constructions are called falles (“torches”). Traditionally, the falla in the Plaça de l’Ajuntament in Valencia is burned last. Each falla is laden with fireworks which are lit first. The construction itself is lit either after or during the explosion of these fireworks. Many neighborhoods have a falla infantil (a children’s falla, smaller and without satirical themes), which is held a few meters away from the main one. This is burnt first, at 10:00 pm. The main neighborhood falles are burnt closer to midnight; the burning of the falles in the city centre often starts later. So where does the tradition come from? While there are a number of speculations regarding the origin of the Falles festival, most researchers believe that the Falles developed from the celebration of the spring equinox, which is celebrated with bonfires in many traditions worldwide. Many suggest that in Spain it started in the Middle Ages, when artisans disposed of the broken artifacts and pieces of wood they saved during the winter by burning them to celebrate the spring equinox. Valencian carpenters used planks of wood called parots to hang their candles on during the winter, as these were needed to provide light for the carpenters to work by. With the coming of the spring, they were no longer necessary, so they were burned. Over time, with the strengthening of the Catholic traditions, the date of the Falles festival was made to coincide with the celebration of the festival of Saint Joseph, the patron saint of carpenters, and also became the Father’s Day in Spain. Did you know that you can speak Spanish fluently by the time of the next Fallas festival? Imagine visiting Valencia for this exciting festival and being able to get around with no interpreter (and no English!). Whether you’re thinking this trip to Spain or just making your next Carribean vacation more fun by speaking Spanish to the locals, you can start learning Spanish FREE now! Visit Visual Link Spanish website and enjoy our FREE lessons, or choose to upgrade for a full award-winning Spanish course from Visual Link Spanish.